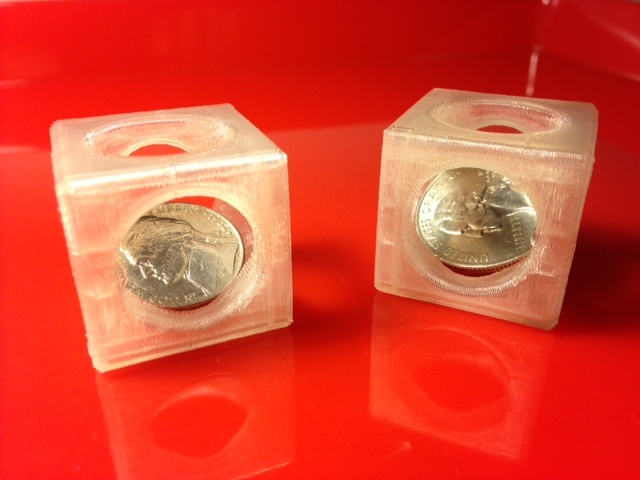 For the first day, a simple coin trap for nickels or quarters which we designed in Tinkercad. Settings: We printed these on the MakerWare "low" setting with no raft and no supports on blue painter's tape. Halfway through the print you can pause and drop in the coin, which then gets trapped by the rest of the print. Each one took 20 minutes to print with these settings. Technical notes: Use "pause" rather than "cold pause", and drop in the coin as quickly as you can. The PLA will continue to extrude out a bit during the pause. In "cold pause" this results in some filament being missing from the next layer of the print, and an unstable print. In "pause" this makes a small bump on the model but that helps to keep the filament inside the extruder. Stuff you might want to change: The trap is larger than needed for nickels but a little bit too small for completely free movement of quarters. Suggest scaling down/up accordingly for better fits.